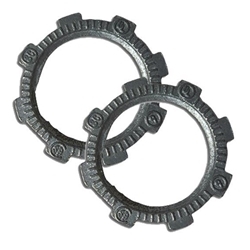 1/2" heavy-duty locknuts are used in dry locations to secure 1/2? threaded conduits or connectors to electrical junction boxes or enclosures. Garvin Industries? heavy gauge steel construction maintains mechanical protection and solid grounding of the conduit to the designated electrical junction box or enclosure. Heavy duty locknuts are zinc electroplated for excellent corrosion protection in damp locations. Serrated teeth on the locknut bite into the box and enclosure to prevent vibratory loosening of the connection.